Blackpool at War – Blackpool was a vibrant town in the war years. It was considered less likely to face attack than towns in the South and East of Britain and had a ready-made supply of accommodation. Many hundreds of soldiers and airmen were billeted to Blackpool which was the biggest recruiting centre for the RAF and over 20,000 American airmen took over the Warton airfield. 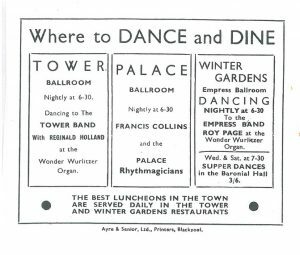 With many re-located civil servants and evacuees, it is not surprising that entertainment was much in demand. 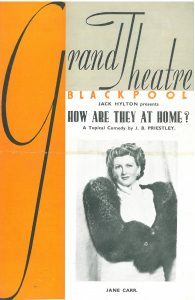 Owing to the bombing of London, most West End theatres were closed and many plays were premiered at Blackpool’s very own Grand Theatre. 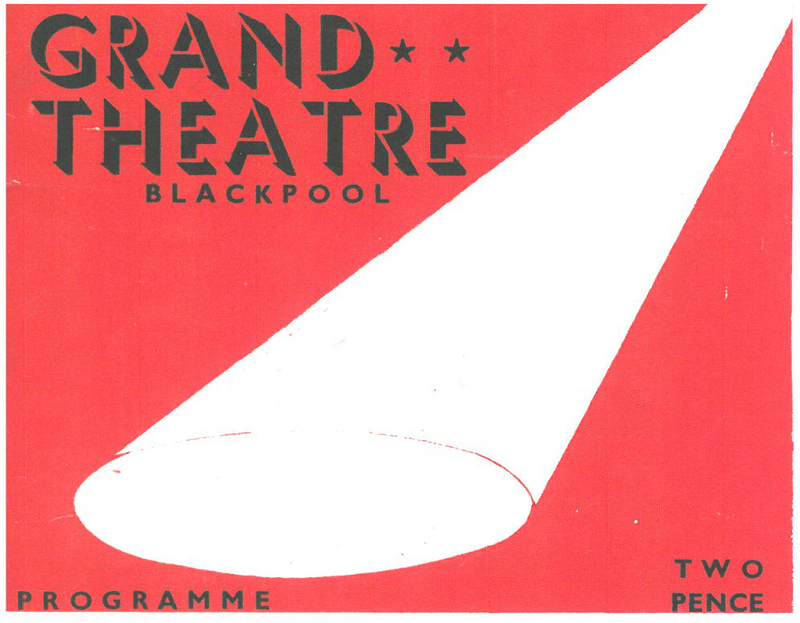 The bright lights of the London stages came to Blackpool. The introduction of the blackout from early September 1939, and more importantly the start of the London ‘Blitz’ a year later, led to massive disruption of the entertainment industry in general and the theatre world in particular: overnight, theatres closed down with several of them never to reopen, London’s West End was thrown into chaos. 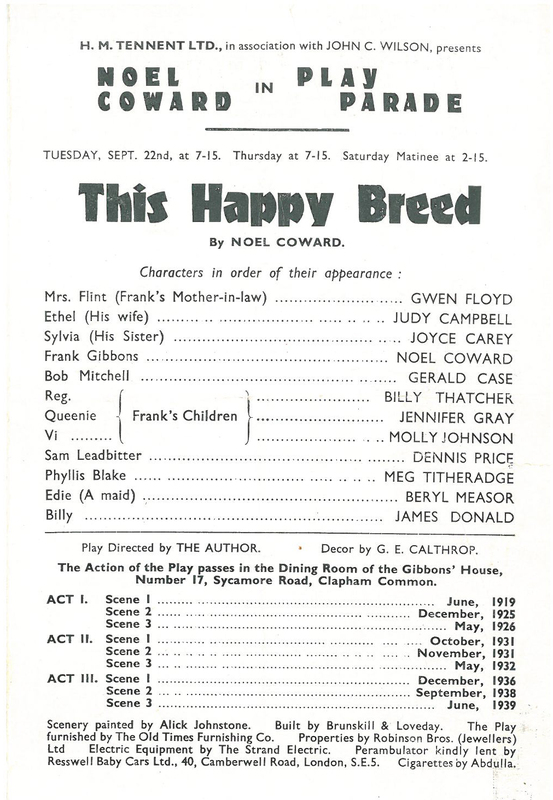 Two theatres started up again when restrictions were eased in mid September 1939. One was The Windmill which offered a programme of humour, music, it claimed ‘We never close’, and sometimes claiming that it was the only theatre never to do so at this time. A strong claim when most provincial theatres, including the Blackpool Grand Theatre remained open. 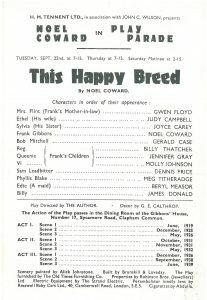 During the war the Council for the Encouragement of Music and the Arts (CEMA) collaborated with existing companies to bring high quality productions to local audiences. 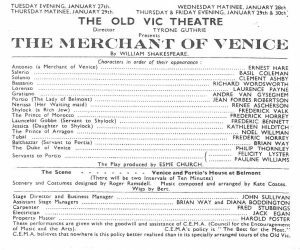 In 1940 the Sadlers Wells Ballet brought Margot Fonteyn, Frederick Ashton and Robert Helpmann and the Old Vic Company commenced a long association with Blackpool’s Grand, with stars such as Jean Forbes-Robertson in the Merchant of Venice (1942) and Flora Robson in Guilty (1944). 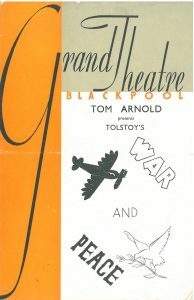 Blackpool was a major war centre. 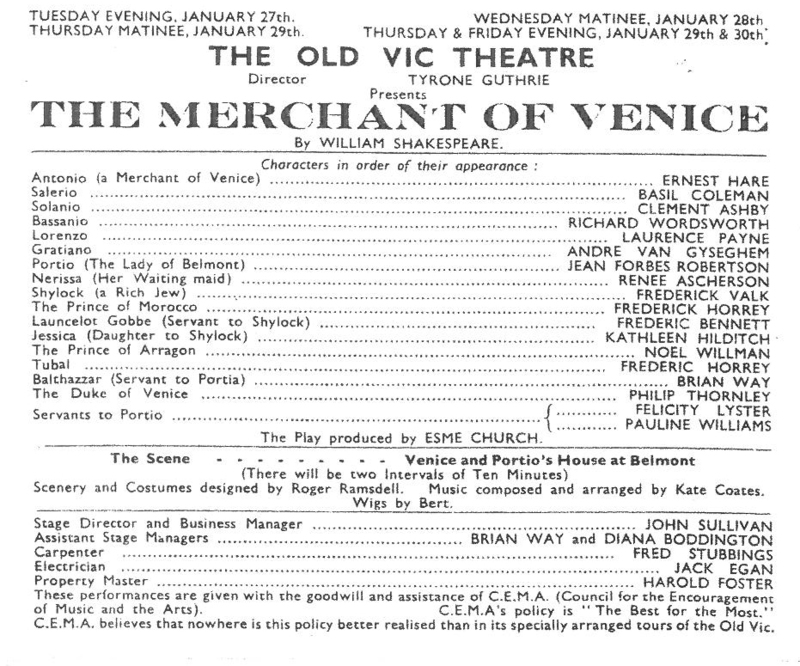 The theatres thrived, with fourteen different show every night, for most of the war. The audiences came not only from holidaymakers who kept coming to the resort as a morale-booster but also from the influx of 4,000 relocated civil servants, the 38,000 evacuees, the huge growth in service personnel, 45,000 airmen were billeted in the town. These people poured into the theatres for their off-duty entertainment. The Americans, based at Warton were particularly prominent, and generous with their money. 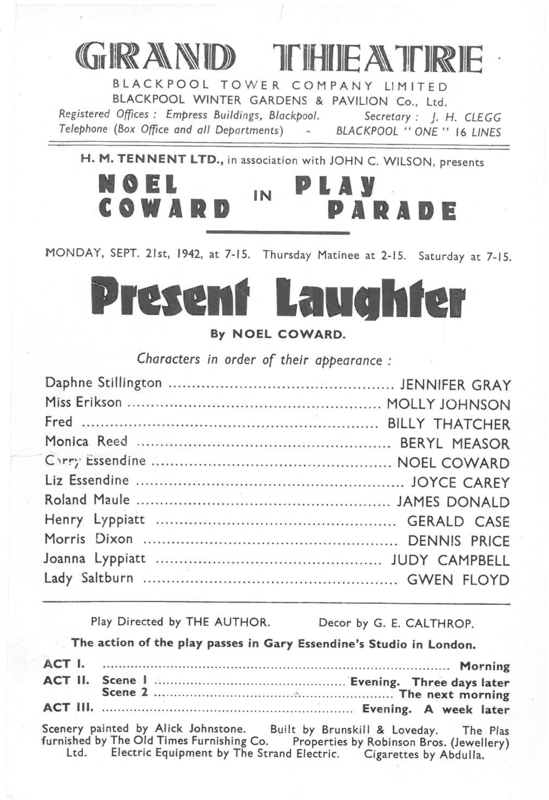 The Blackpool entertainment industry prospered as never before. 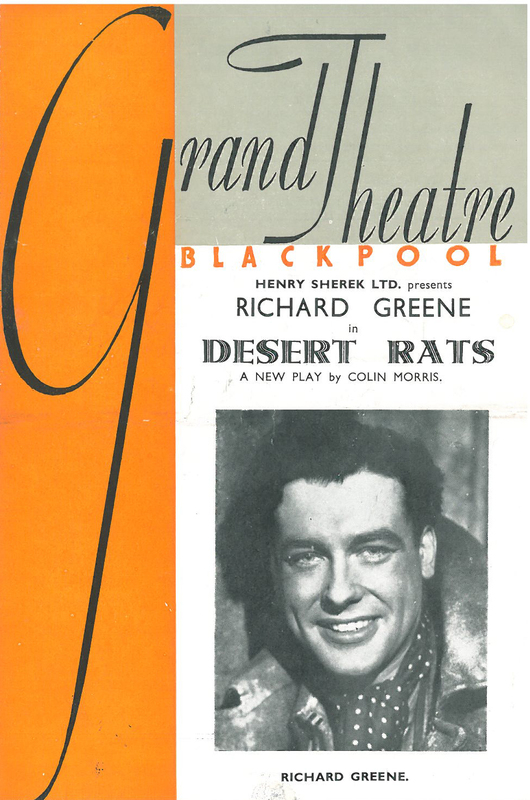 Many of the plays had a war theme – Blackpool at war shows included; War & Peace (1943), They Also Served (1944), Flare Path (1944), Desert Rats (1945), and in 1944 the United States 8th Airforce in Skirts, an all American musical adventure. 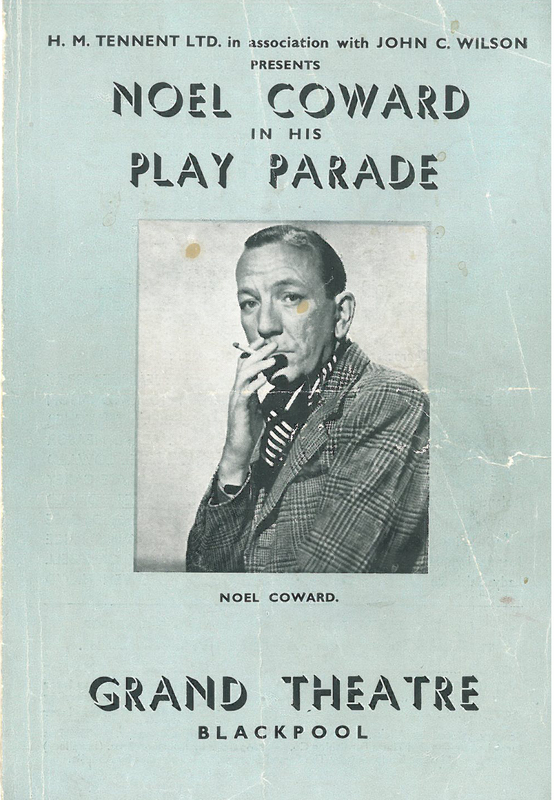 In 1942 Noel Coward brought his Play Parade which featured Present Laughter, Blithe Spirit & This Happy Breed. 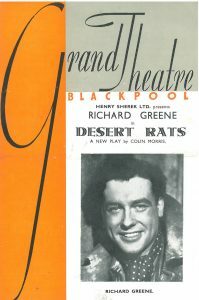 World premieres included The Devil’s Disciple with Robert Donat in 1940, Lupino Lane in La-Di-Da-Di-Da and Richard Attenborough in Brighton Rock (1943), Tomorrow’s Eden with Diana Churchill (1944) and Duet for Two Hands with John Mills in 1945. 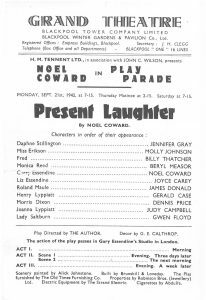 Paper was scare and needed for the war which had an impact on the size of the programmes at the theatre. This was just at the beginning on the war until resources could be found. 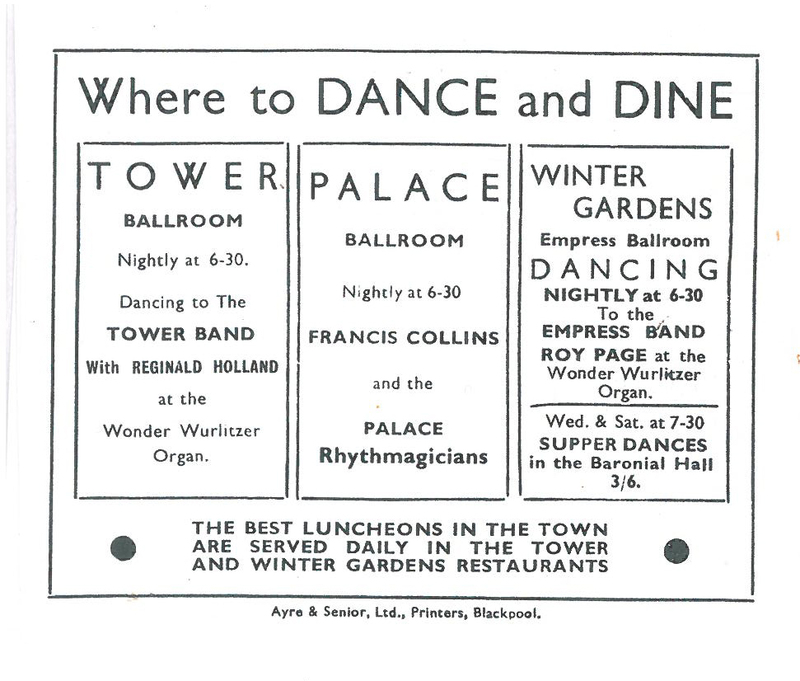 Below is a copy of one of the brochures from the war time, costing Two Pence and no bigger than your palm. 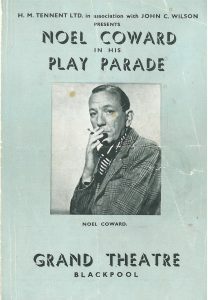 From 1942 onwards, the programmes always featured a photograph of the star on the cover. Interested in finding out more of the history of The Grand? Then click here.